The National Child & Adult Care Food Program Forum (The Forum) was created to form a community of member organizations dedicated to the ideals of high quality nutrition services for all children in child care settings. The Forum was organized in 1983 with the first meeting being held at the Save the Children Family Child Care Conference in Atlanta, GA. Since the mid-1980's the Forum has been recognized in Washington as the leading CACFP public policy organization. The Forum is led by its President and voluntary Board of Directors, with advisement from its ex-officio members. The full Board of Directors conducts monthly conference calls and meets three times per year. ​The National CACFP Forum serves as the national advocacy organization that protects viability, perfects policy, and promotes leadership for the Child and Adult Care Food Program. The Child & Adult Care Food Program (CACFP) is a federal program administered by the U.S. Department of Agriculture's Food and Nutrition Service. The CACFP is a key building block in creating and maintaining quality, affordable child care. Sponsoring organizations provide a bridge between CACFP participants and the resources provided by this complex program. The Forum continues to be interested in accessing quality child care for low income people and works to maintain the program for the benefit of all children. 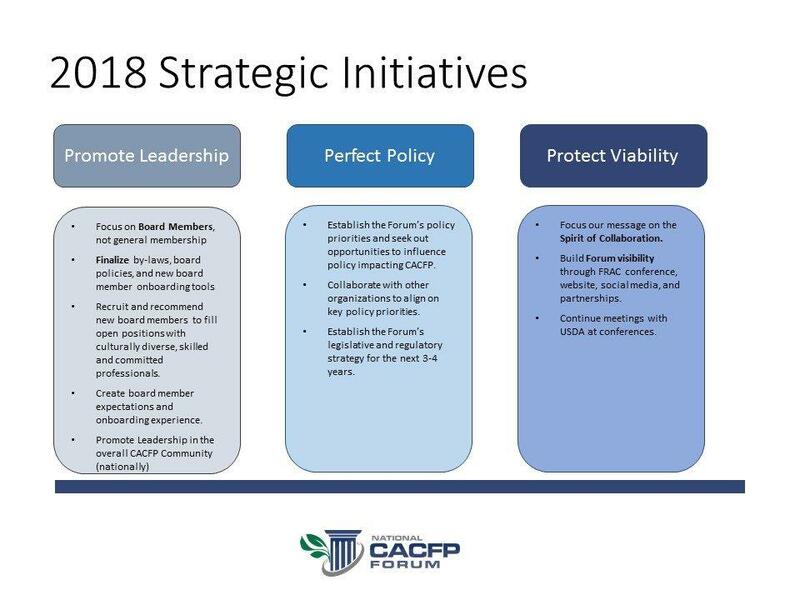 Because program policies differ from state to state, CACFP sponsors organize and share information to improve service delivery, demonstrate support for quality nutrition, and establish accountability for proper and efficient administration of CACFP funds and services. Efforts of members have served to provide public support to maintain the CACFP as an ongoing federal program to improve the nutrition of children. The Forum focuses its public policy initiatives on ensuring the continuation of the CACFP. The ongoing work of the Forum benefits more than 800 FDCH sponsors, 57,000 Centers including Afterschool programs, over 100,000 child care providers and the nearly 4.3 million children enrolled. In Fiscal Year 2013, USDA reimbursed $2.6 billion to providers. CACFP provided 1.96 billion total meals and snacks during Fiscal Year 2013.